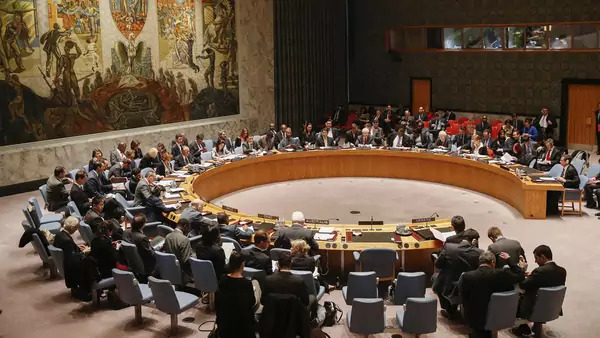 The Security Council, the United Nations’ principal crisis-management body, is empowered to impose binding obligations on the 193 UN member states to maintain peace. The council’s five permanent and ten elected members meet regularly to assess threats to international security, addressing issues that include civil wars, natural disasters, arms control, and terrorism. Structurally, the body remains largely unchanged since its founding in 1946, stirring debate among many members about its efficacy and authority as a mediator on matters of international security. Syria’s civil war has posed particular challenges to the Security Council as it has attempted to stabilize the region, curb the use of chemical weapons, and relieve a mounting humanitarian crisis. Similarly, Russia’s frictions with the United States and European Union following its annexation of Crimea in early 2014 and North Korea’s nuclear weapons program have added tensions. What is the Security Council’s structure? The Security Council comprises five permanent members—China, France, Russia, the United Kingdom, and the United States—collectively known as the P5. Any one of them can veto a resolution. The council’s ten elected members, which serve two-year, nonconsecutive terms, are not afforded veto power. The P5’s privileged status has its roots in the United Nations’ founding, in the aftermath of World War II. The United States and Soviet Union were the outright victors of the war, and, along with the United Kingdom, they shaped the postwar political order. As their plans for what would become the United Nations took shape, U.S. President Franklin D. Roosevelt insisted on the inclusion of the Republic of China (Taiwan), envisioning international security presided over by “four global policemen.” British Prime Minister Winston Churchill saw in France a European buffer against potential German or Soviet aggression and so sponsored its bid for restored great-power status. The members of the P5 have exercised the veto power to varying degrees. Counting the years when the Soviet Union held its seat, Russia has been the most frequent user of the veto, blocking more than one hundred resolutions since the council’s founding. The United States is the second most frequent user of the veto. China’s use of the veto has risen notably in recent years. In 2014, China joined Russia in vetoing a resolution that would have referred belligerents in the Syrian civil war, including the individuals in the Bashar al-Assad regime, to the International Criminal Court. In 2017, China and Russia vetoed another resolution on Syria, which would have sanctioned entities involved in the production of chemical weapons. Russia vetoed several other resolutions on Syria later that year and in 2018. Most recently, in June, the United States vetoed a resolution condemning Israel for Palestinian civilian deaths during border protests in Gaza. The council’s presidency rotates o­­­­n a monthly basis, ensuring some agenda-setting influence for its ten nonpermanent members, which are elected by a two-thirds vote of the UN General Assembly. The main criterion for eligibility is contribution “to the maintenance of international peace and security,” often defined by financial or troop contributions to peacekeeping operations or leadership on matters of regional security likely to appear before the council. A secondary consideration, “equitable geographical distribution,” gave rise to the regional groups used since 1965 in elections: the African Group has three seats; the Asia-Pacific Group, two; the Eastern European Group, one; the Latin American and Caribbean Group, two; and the Western European and Others Groups (WEOG), two. Each has its own electoral norms. An Arab seat alternates between the African and Asian blocs by informal agreement. Turkey and Israel, which has never served on the council, caucus with WEOG. Subsidiary organs that support the council’s mission include ad hoc committees on sanctions, counterterrorism, and nuclear, biological, and chemical weapons, as well as the international criminal tribunals for Rwanda and the former Yugoslavia. Within the UN Secretariat, the Department of Peacekeeping Operations and Department of Field Support manage field operations. The Peacebuilding Commission, established in 2005 as a repository of institutional memory and best practices, serves an advisory role. What are the Security Council’s tools for conflict management? The Security Council aims to peacefully resolve international disputes under Chapter VI of the UN Charter, which authorizes the council to call on parties to seek solutions via negotiation, arbitration, or other peaceful means. Failing that, Chapter VII empowers the Security Council to take more assertive actions, such as imposing sanctions or authorizing the use of force “to maintain or restore international peace and security.” Peacekeeping missions are the most visible face of the United Nations’ conflict-management work; in mid-2018, following the completion of its mission in Liberia, the council was overseeing fourteen operations involving roughly ninety thousand uniformed personnel. Constrained by U.S.-Soviet rivalry, the Security Council acted infrequently in the four and a half decades between its founding and the close of the Cold War. During that time, it authorized seventeen peacekeeping operations [PDF]. Since 2014, heightened tensions between the United States and Russia have manifested anew in the council, leading to concerns that the body may be less able to defuse crises. For example, in July 2015, Russia vetoed a resolution that would have created an international tribunal to prosecute the pro-Russia separatists in eastern Ukraine who are thought to have shot down a Malaysian Airlines passenger jet using a Russian-made missile. The Syrian conflict has proven to be particularly difficult to manage, given that Russia has used its veto power a dozen times to block resolutions aimed at holding the Assad regime accountable for atrocities documented by UN sources. The Security Council has authorized fifty-four peacekeeping operations in the years since the Cold War, many responding to failing states, civil wars, or complex humanitarian emergencies and deploying to conflict zones in the absence of cease-fires or parties’ consent. Under more muscular mandates, they have combined military operations—including less restrictive rules of engagement that allow for civilian and refugee protection—with civilian tasks, including policing, electoral assistance, and legal administration. Developing nations provide the lion’s share of personnel. Regional organizations have played an increasingly important role in peacekeeping and conflict resolution, in some cases prodding the council to action and in others acting as subcontractors on its behalf. For instance, the council authorized the use of force in Libya in 2011 after the Arab League called for a no-fly zone, which the North Atlantic Treaty Organization (NATO) then executed. Experts point to the increased will and capacity of the African Union, which has partnered with the United Nations in carrying out missions in Somalia and the Darfur region of Sudan. What sanctions measures are available to the Security Council? The sanctions provisions in Article 41 of the UN Charter, dormant during much of the Cold War, have become one of the Security Council’s most frequently employed tools. The body had imposed sanctions just twice prior to the fall of the Berlin Wall: in 1966, a trade embargo was enacted against Southern Rhodesia (present-day Zimbabwe), and in 1977, an arms embargo was enacted against apartheid-era South Africa. The council began to make regular use of sanctions in the early 1990s, starting with Iraq, the former Yugoslavia, and Haiti. As of 2018, fourteen Security Council sanctions regimes, listing more than six hundred individuals and nearly three hundred entities, are in place. After Iraqi President Saddam Hussein’s invasion of Kuwait and the subsequent Gulf War, the United Nations oversaw an effective disarmament regime. The United Nations subsequently established the Oil-for-Food Program, a sanctions program that was intended to ensure humanitarian services but was marred by exploitation and corruption. An independent inquiry found that some two thousand firms—many of them based in P5 countries—paid kickbacks totaling nearly $2 billion to the Iraqi government. So-called smart sanctions emerged in the mid-1990s as an alternative to what Secretary-General Kofi Annan called the “blunt instrument” employed in Iraq, targeting discrete economic and political matters and specific individuals deemed threats to international security. Certificate-of-origin regimes have curtailed trade in so-called blood diamonds that finance several civil wars, for example. Arms embargoes, travel bans, asset freezes, and import/export bans on individual goods, rather than comprehensive embargoes, are now the norm. But targeted sanctions have raised human rights concerns of their own. To be delisted, blacklisted individuals, entities, and items—often those with dual uses, such as agricultural or medicinal applications—require an affirmative vote of sanctions committees, in which all Security Council members are represented. Must the Security Council authorize force? Under the UN charter, the use of force is legal only in cases of self-defense or when it has been authorized by the council. The question of legitimate use of force—as distinct from strict legality—remains contentious. The emergence of the responsibility to protect (R2P) in the early 2000s appeared to justify the use of force outside Security Council authorization by qualifying the principle of noninterference in sovereign affairs. The doctrine, as adopted by the UN General Assembly in 2005, stipulates that states have a responsibility to protect their populations from crimes against humanity; the international community has a responsibility to use peaceful means to protect threatened populations; and when a state “manifestly fails” to uphold its responsibilities, coercive measures should be collectively taken. Successive U.S. administrations have argued that humanitarian intervention can legitimately be undertaken with the backing of regional organizations or coalitions of the willing. But Secretary-General Ban Ki-moon rejected this position, saying, “The responsibility to protect does not alter, indeed it reinforces, the legal obligations of Member States to refrain from the use of force except in conformity with the Charter.” This debate was revived in the run-up to the 2011 NATO-led Libya intervention and continues with the ongoing Syrian civil war. What criticisms has the Security Council faced? Many critics, including member states from the developing world, charge that the council’s structure does not reflect current geopolitical realities. The council was expanded from six elected members to ten in 1965, and, in 1971, the People’s Republic of China took the permanent seat previously occupied by the Republic of China (Taiwan). Since then, the body’s composition has remained unchanged. Regional powers, such as Brazil, Germany, India, Japan, Nigeria, and South Africa, have sought to enlarge the council or secure permanent seats of their own. Others have called for a common European seat as the European Union moves toward a unified security policy. The debate about expansion is often framed as a trade-off between legitimacy and efficacy. Saudi Arabia took the unprecedented step of declining a Security Council seat in October 2013, announcing a day after it was elected to a 2014–2015 term that it would not serve in the absence of institutional reform. Other critics include advocates of R2P, who say the veto gives undue deference to the political interests of the P5, leading to inaction in the face of mass atrocities. Zeid Ra’ad al-Hussein, the UN human rights chief from 2014 to 2018, repeatedly criticized the outsize power of the veto-wielding member states, warning that without institutional change, the United Nations could collapse. But it is not just P5 members who have demonstrated reluctance to use force. Aspirants to permanent-member status, including Brazil, Germany, and India, have generally opposed interventions as violations of sovereignty. While R2P advocates criticize the Security Council and its members for a lack of political will, others question the United Nations’ conflict-management capacity, often citing 1990s peacekeeping crises in Somalia, the former Yugoslavia, and Rwanda. In the shadow of its 1993 experience in Somalia, in which eighteen Army Rangers were killed in an attempt to capture a warlord, the United States was among the powers that prevented a robust UN response in Rwanda. Despite alarming reports received by the council in 1994, it declined to respond as an estimated eight hundred thousand people were killed in a genocide committed against ethnic Tutsis. The United Nations also suffered humiliating defeats in the Balkans, where peacekeepers were used as human shields in the siege of Sarajevo and failed to protect civilians in the designated safe area of Srebrenica from massacre. Experts say these missions were undermined by both logistical and political problems, including muddled mandates, inadequate resources, and the parochial interests of major powers. Peacekeeping mandates continue to be scrutinized for their scope, cost, and cases in which peacekeepers themselves have committed abuses. A 2000 self-evaluation, commissioned by Annan and led by veteran envoy Lakhdar Brahimi, said the United Nations had “repeatedly failed,” and would continue to do so absent “significant institutional change and increased financial support.” In 2016, an investigation revealed a series of sexual assaults in the Central African Republic, where at least twenty-five minors were abused by forty-one peacekeeping soldiers from Burundi and Gabon. However, many experts say the United Nations’ overall track record is relatively strong: recent studies have found that, in general, UN peacekeeping prevents the resumption of violence in postconflict scenarios. What are the Security Council’s prospects for reform? Substantial reform is seen as remote because amending the UN Charter requires an affirmative vote and domestic ratification by two-thirds of UN member states. This includes all of the Security Council’s permanent members, which are unlikely to take measures that would curb their own influence. While there is broad agreement among UN members that the Security Council’s makeup is outdated, each of the various proposals for reform inevitably leaves some aspirants alienated. Some proposals call for additional permanent members and others for a new class of elected seats that have the possibility of renewal. In the absence of charter reform, smaller states have advocated for procedural changes, including greater transparency and closer consultations with troop-contributing countries. The U.S. ambassador to the United Nations, Nikki Haley, has raised new calls for reform. In a CFR event prior to the United States’ April 2017 presidency of the Security Council, Haley vowed to make human rights and peacekeeping reforms a priority, citing the “predatory behavior” of the government of the Democratic Republic of Congo as a reason to scale back the UN peacekeeping mission there. The operation’s mandate was renewed two days later, but with three thousand fewer troops. Jesus Rodriguez and Fatimah Alyas contributed to this report. CFR’s Global Governance Monitor evaluates the international regime for armed conflict and discusses policy options for strengthening the UN’s conflict prevention and management capacities. As the case for U.S. intervention in Syria came to a head, Yale Law School’s Oona A. Hathaway and Scott J. Shapiro argued that the use of force absent Security Council authorization would only further undermine global security, while Northwestern University’s Ian Hurd stressed that international law has since evolved, rendering Security Council authorization moot. The Security Council Report, a New York–based organization that provides independent analysis, offers a comprehensive preview of 2017 council elections. The International Peace Institute evaluates the Security Council’s mixed record of involvement in civil wars since the Cold War. British NGO Transparency International argues that UN peacekeeping missions have been undermined because of an institutional culture that sees corruption as a marginal issue. The United Nations maintains a list of P5 vetoes from 1946 to the present.